I captured two photos of the simple form ‘critter’ recently. One on 5 March 2010 3 PM , another on 9 March 2010 3:17 pm. 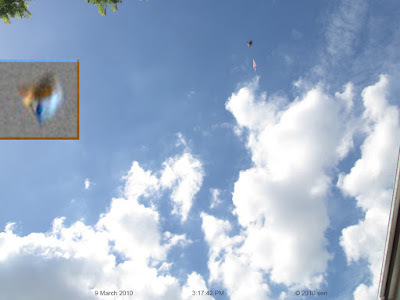 The last one was from two continuous pictures, the first photo shows a ufo in complex blurry shape, hanging above my roof ( seen the attached picture). The second photo shows a golden color dome shape object with a large black eye. half of It’s body still hiding inside the pink cloak. Due to inconvenience, I cannot send it to you. That is the third times I captured the same kind image.